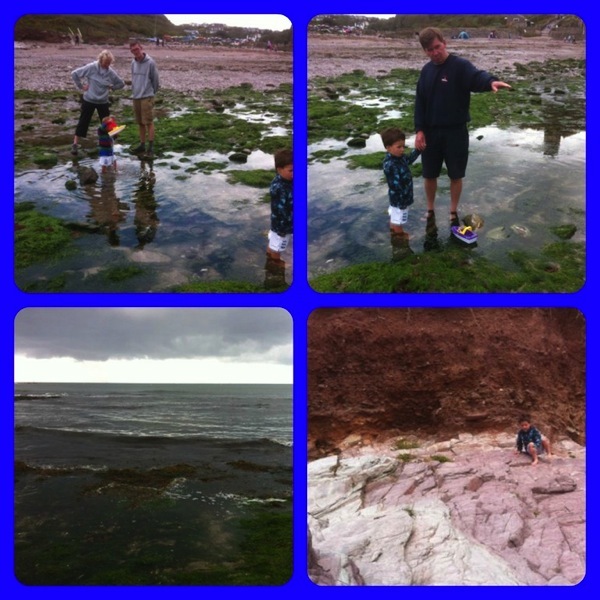 Last week I wrote about our trip to Mothecombe beach in Devon when we were on holiday. That’s a mostly sandy beach on an estuary with lovely shallow water until quite a way out from the shore. Another day of our holiday we went just 5 minutes drive down the road from the edge of Plymouth to Wembury beach. Since the great storms that hit the south west coat last year, this has been a very rocky beach, and when it’s low tide, it’s perfect for a spot of rock pooling. Andrew had spotted the old net in Grandma and Pop’s shed with the other beach toys earlier in the week and was desperate to have a go with it. 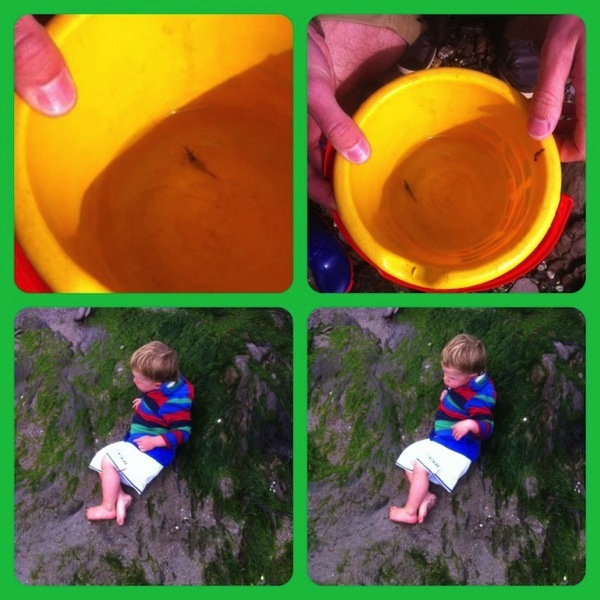 So we’d promised him a morning at a rocky beach to try his hand at rock pooling. Unfortunately the net that was once Daddy’s had seen better days, so we treated him to a brand new one from the cafe on the beach, and it was very reasonably priced considering we were a captive audience. When we arrived it was pretty much bang on low tide and there were lots of fantastic pools. We all set out across the rocks, wearing sensible shoes (wellies for the boys) and carrying our net and buckets. Joel is a keen climber, so was also in his element, even though he wasn’t in the least bit bothered about looking for animals. Andrew wanted to use his net when we spotted a few things, but the kinds of creatures that we saw really needed an adult with a faster hand and a better eye for catching them as they were too quick for him. We didn’t actually catch much in the end – this shrimp was the highlight really, and we let him go back home after a few minutes. We did see lots of limpets clinging to the rocks, and barnacles, and anemones which I said looked like shiny cherries on the rocks. We saw lots of little crabs too, but they were too small to catch in our net. Joel was a bit of a handful really, and soon got tired so had a tantrum about not being able to go it alone across the rocks! It’s an activity that he’ll need another couple of years to appreciate fully. Andrew was keen to give it a go though, even if he couldn’t do lots himself. We’ll definitely be back here in future years. 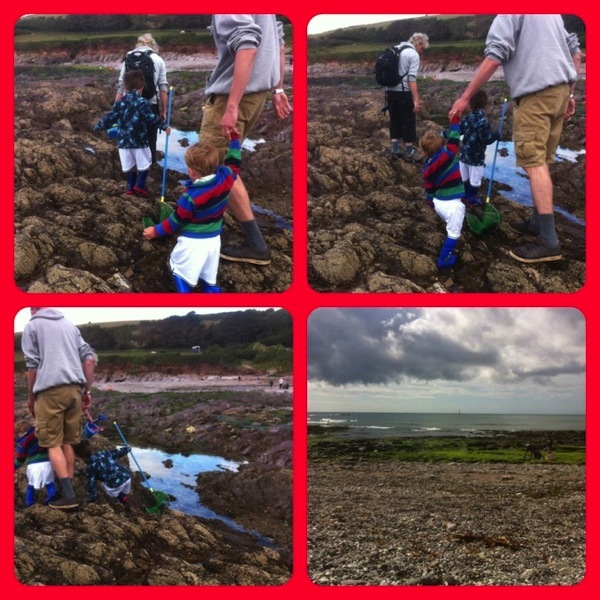 There is also a fantastic marine study centre just off the beach at Wembury, which is open to the public and you can have a look round at the exhibit telling you all about the sea plants and creatures of the area. Again, a bit lost on our boys for now, but give them a few years and I’m sure they will be very interested. Linking up with the fantastic Country Kids linky over at Coombe Mill’s blog. The weather forecast for the week that we were on holiday in Devon wasn’t as amazing as it had been earlier in the summer, so we decided to go to the beach on our second day there, the best looking day of the forecast, just in case we didn’t get another chance. Grandma and Pop had recently invested in a new blow up dinghy, since the one that Daddy and his siblings used to uses kids finally bit the dust last year when we were on holiday. One of the best beaches for small children that we’ve been to near their house is Mothecombe – the beach on the Erme estuary is fantastic, because it’s so shallow, you have to go out a long way before you can’t stand up any more as an adult, and at low tide, you can walk across the estuary so it’s not even deep enough to swim in. 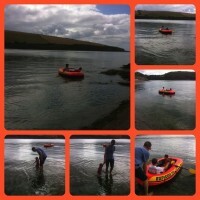 This makes it ideal for a row in a dinghy with little ones. We got there quite early and were the first ones on the beach. Not surprising given that it was spitting slightly with rain, though was fairly warm still. 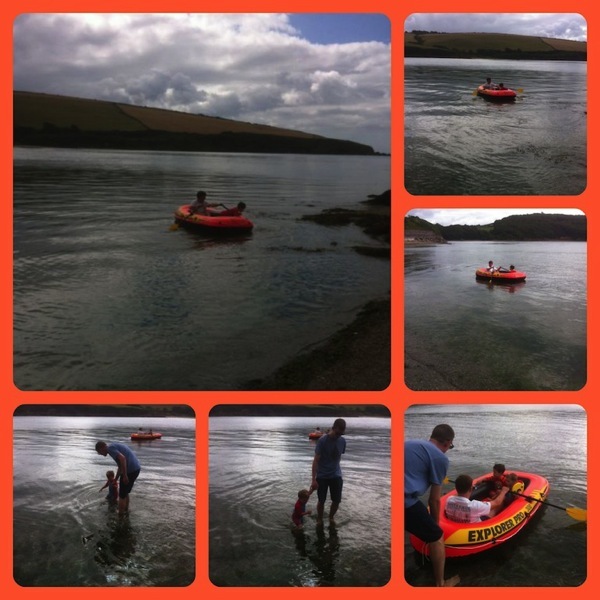 We found a good spot and got our various bits of entertainment out – buckets and spades, bats and balls, football, kites, sand castle flags, and of course the boat with pump and oars. Pop and Daddy set to and blew up the boat, while the rest of us played in the sand and paddled in the sea – it was high tide so there wasn’t as much beach then as there was later in the day. Once the boat was in working order, the boys both went out a few metres from the shore with Pop rowing, They absolutely loved it, and wanted to keep doing it several times for the rest of our time on the beach that day. Most of us adults had a turn to be in the driver’s / rower’s seat with either one or two boys with us. We had lots of fun doing all sorts of activities on the sand and in the water. Joel was quite happy to sit and play with the sand, putting it into buckets with his hands and throwing it about. It’s the longest I’ve seen him sit doing something for a while. 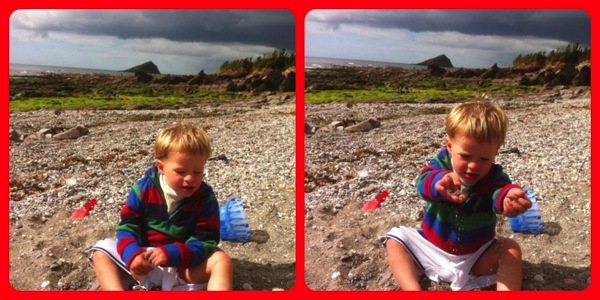 Of course he did get up and play too, and also destroy Andrew’s sand castles, as is typical behaviour for each of them. We had the obligatory British picnic lunch on the beach too, although at that point it was clouding over and just after we’d eaten we had a short and light rain shower, similar to a few that we’d had earlier in the morning, but it was the kind of shower that by the time you’d got a coat on, it was over and sunny again. 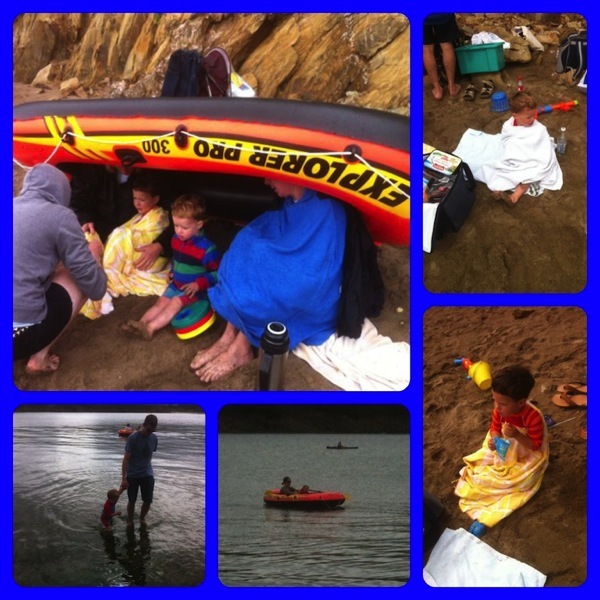 The boat came in useful as a shelter for the boys though, with an adult at each end holding it up! Joel was getting tired after lunch, but we’d decided to see if he would have a nap in the buggy as everyone else was having a lot of fun. And he actually did fall asleep during a short push in the buggy. That gave the rest of us a chance to have a rest too, except those who were taking it in turns to row Andrew in the boat. By about 3pm, the tide was about half way out and there was much more beach, not that we had to share it with many people because it wasn’t very busy at all. Andrew and I went on a walk along the estuary shore, and got to the bit where you can walk across at low tide. We could have walked across then, because there was only a shallow bit of water to walk through, but we knew there wasn’t too much time left on the beach because we had to get back home for 4.30pm. So we walked back across the beck, following the footprints that we’d made on the way. Except when we were not quite back, we saw a sand bank higher than the water level out to sea slightly. So we waded through the shallow water, and came to our very own ‘island’ that had no footprints on yet. Then it was just a short walk back through the water to the part of the beach where the others were sat. Gradually we packed up all our stuff and set off up the hill to the car park. Joel stayed asleep until we got to the car, and Andrew fell asleep in the car! It’s the sign of a good day when Andrew naps these days. 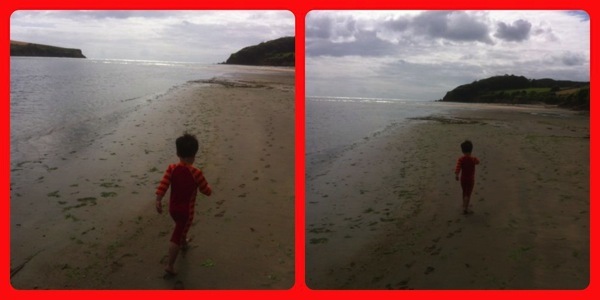 I’d definitely recommend Mothecombe beach for little ones. It’s so quiet, not many people seem to know about it, or would rather not have the walk down (and up) the hill to (and from) the beach, but we think it’s worth it. 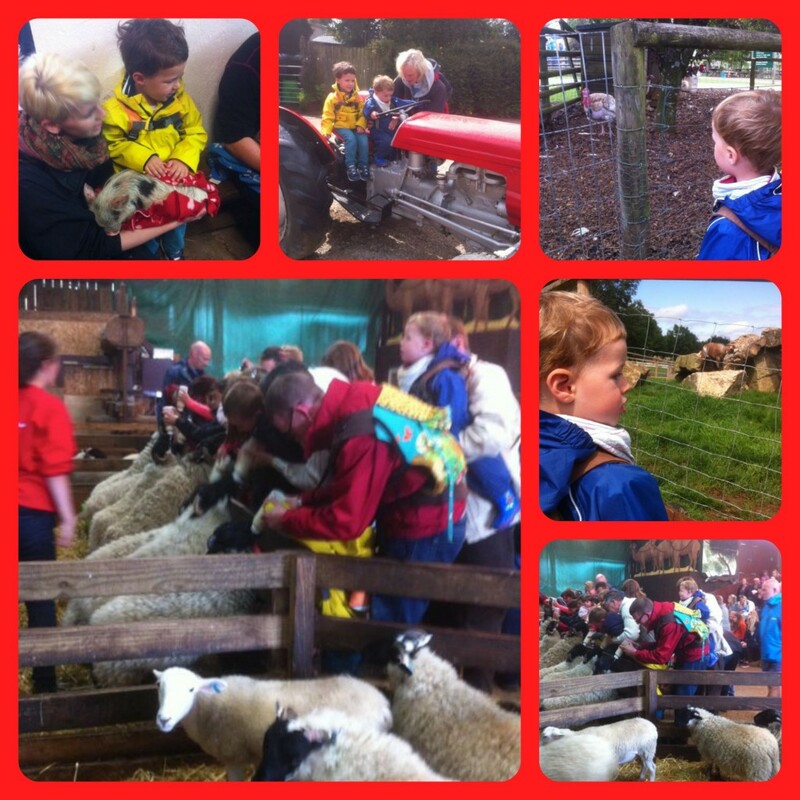 When the boys’ Grandma asked people with small children where are some good places to go with little ones in the area local to them, most people said Pennywell Farm near Buckfastleigh in Devon. It’s been going for 25 years, but they hadn’t been as a family when Daddy and his brother and sister were little, so we decided that we had to try it out. And it turned out to be an amazing day out. We went on a day that we knew didn’t have a fantastic weather forecast because although lots of it is outdoors, there is quite a bit of indoor stuff too. The first area that we came to once we’d paid our entrance fee was the guinea pig pens. There were some benches where you could sit down, put a blanket over your knees, and have a hold and stroke of a guinea pig. Andrew was keen to have a hold, so did so with some help. The guanine pigs were very tame and happy to sit and be stroked. Joel was less keen! Then we walked around the main yard in the centre of the farm, and saw various animals in their pens, like sheep, alpacas, shire horses, goats and more. The boys were happy to be able to see them all through the fences and the animals were obviously used to kids poking about. Soon we heard a bell ringing and a lady announcing that lamb feeding was about to begin in the main barn, so we headed over and got a seat on some of the hay bales in the tiered seating in the barn. It was a great view of the feeing pens. She explained that these lambs couldn’t be fed by their mummies because a ewe can only care properly for 2 lambs, so if she has more, then the littlest/weakest/daftest ones get kicked out the way and don’t always survive. So these were those types of lamb, and were being bottle fed on a mixture of goat’s milk from the farm goats and sheep formula milk. I was very interested in this lactation information! Andrew got to hold one of the bottles, though Daddy had to help because the lamb was very strong and pulled hard on the teat when sucking. Just past the main barn was a smaller barn where the Pennywell miniature pigs were. Apparently these were bred at Pennywell for their small and cuddly size. And you could see that they liked nothing more than getting lots of cuddles from the guests. We sat down on a bench and got to hold a pig between Andrew and me, and he loved being stroked, nearly falling asleep on my lap. Joel wasn’t that bothered, but was happy to run around looking at other animals. 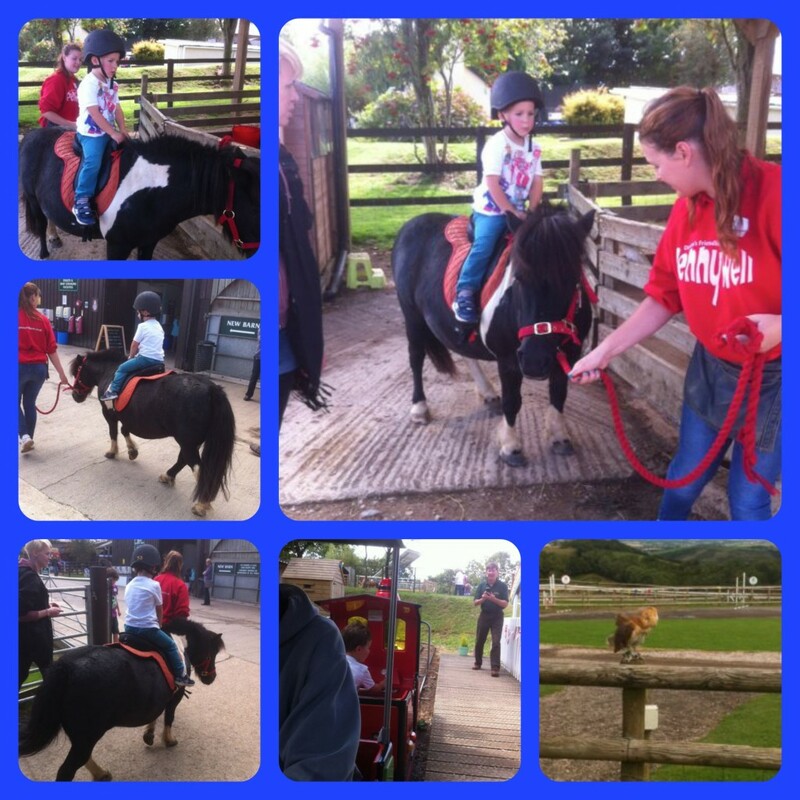 We’d seen some children having donkey and pony rides, so we headed over to where the animals were standing and saw that we had to book a slot, so we booked one in for after lunch so that Andrew could have a go. 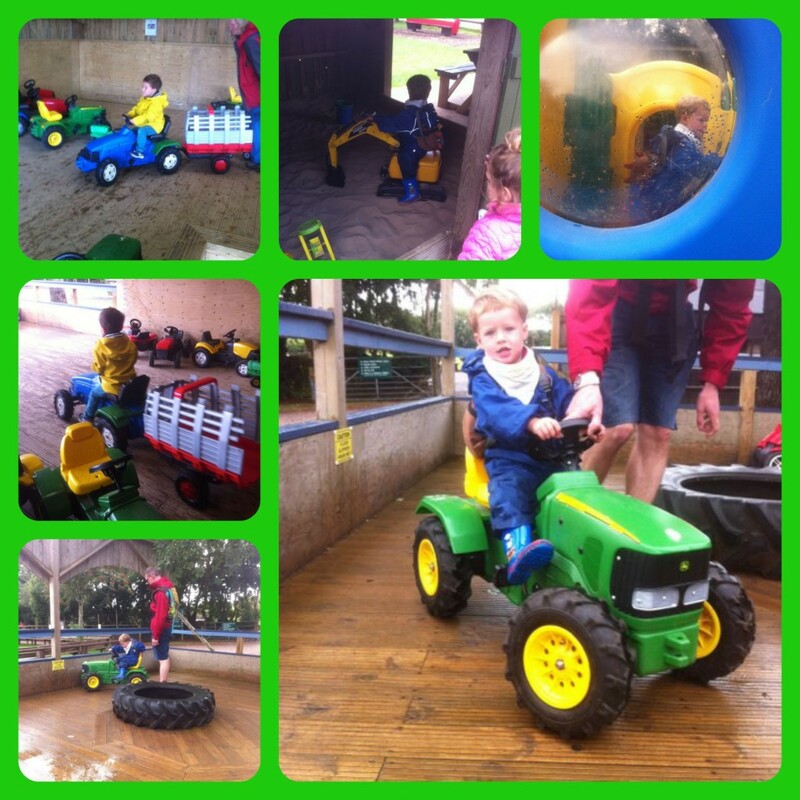 We carried on and came to a covered area that had lots of ride-on tractors to play with. There were various sizes, right from little Joel-friendly ones with no pedals that he could sit on and push with his legs, to big Andrew-friendly ones that he was keen to pedal and steer (mostly avoiding obstacles/other kids on tractors/helping adults). Both boys absolutely loved this bit, so we ended up staying for a while and as there were picnic tables right next to it under the covered area, we decided to eat our lunch there too. Next to the tractors were also some toy ride-on ponies, and Andrew figured out that to make them go you had to bounce up and down on them with your fit in the stirrups and they ‘trotted’ – ingenious idea for a ride-on I thought! After we managed to drag them away from the tractors and ponies, we headed across to the other side of the farm, where there was a tall tower with a fabulous view over the moor to the north, and a playground. We also heard the ‘choo chop’ of a train and then spotted the sign for the ‘Rainbow Railway’. This train was just the right size for a ride with toddlers and preschoolers, and Andrew was very happy that he got to be the driver and the rest of our family sat in the carriages. On our way back from the railway, we stopped and looked around the ‘funky foul’ area where there were all sorts of chickens and the like – some with very funky hair dos! By that time, it was nearly time for Andrew’s pony ride, so we headed back to the main yard. There was an owl display going on just near the pony park, so we managed to see some of that while waiting for the pony. The man was explaining all about how owls fly, hunt and eat their prey. 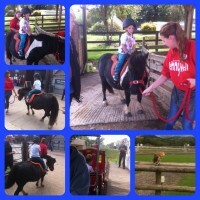 Finally came the time for the pony ride, and Andrew took to it very well. The pony’s name was Yarter and she was 17 years old. He had a ride around the main yard and up towards the tractor rides and back round again near the owl display. By the time the pony fun was over, Joel was getting very tired, having walked around most of the farm himself. Even though we hadn’t done everything on the farm, we decided that that was enough for one day. 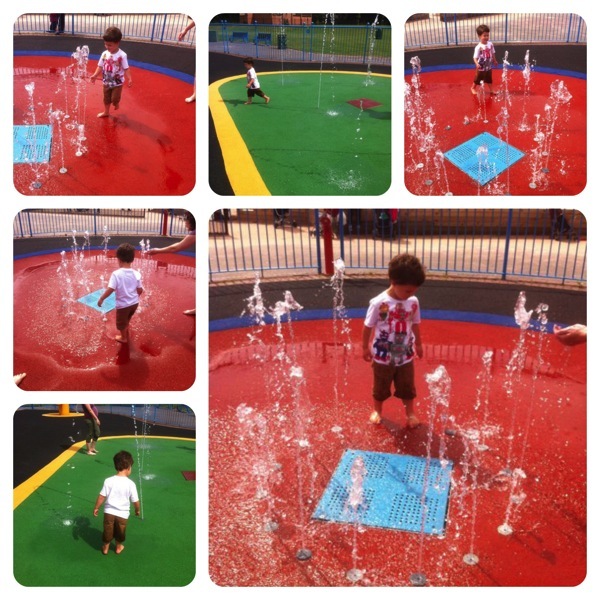 It’s such a great day out for little ones, and even slightly older children. I think for what you get, the entrance fee is very reasonable, and we need to go back again to see what we couldn’t see in one trip. It’s definitely something I’d recommend if you’re in the area. I started writing this post for last weekend’s Country Kids linky but it got forgotten about – I know I keep saying it, but with everything else going on, this poor blog is being neglected a little. But at least I’m still keeping some kind of record of what life is like during the move so we can look back on it and see that we still did fun stuff too. So here it is this weekend instead. Last week when Granny had a day off work, we were thinking about where to go on the lovely sunny day that it was. We knew we’d like to take Andrew’s bike so he could have a good ride, and also a good park for both of them would be nice. I haven’t been to Abbey Fields park in Kenilworth for a long time, though we used to go to the swimming pool there quite a bit as children, but recently I’d been talking with a lady at a toddler group who had just moved back to the area and was raving about how great the new playground was there. So we decided to go and try it for ourselves. 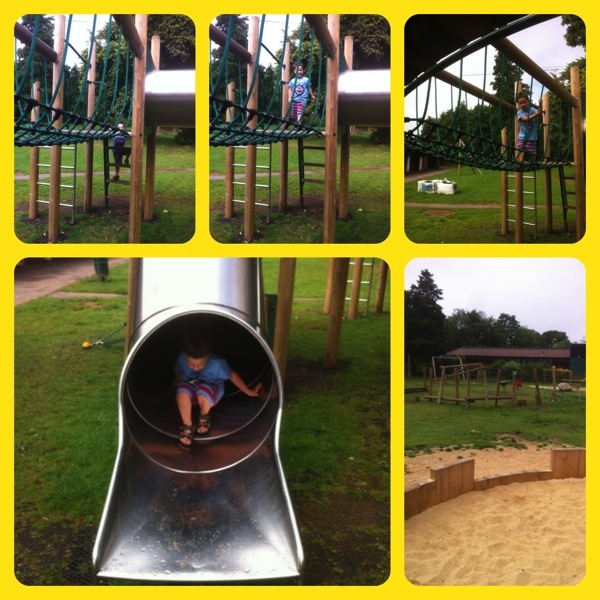 And it turned out to be a fantastic place for the two of them, and although there were 2 of us adults that day, it seemed like a good park for when I’m on my own with the boys too as it has a good fence and plenty to keep them both amused. Joel particularly liked the small climbing frame which is a perfect size for him, not far off the ground but with various challenges for him to have a go at walking/climbing over. There’s a tunnel, a rope bridge and 2 wooden bridges as well as a slide and a few different styles of steps/ladders for him to get up and down from it. The whole thing is on that squashy astroturf type ground that is great for if they fall over on it too. Joel loves to jump – I call him jumping Joel quite often – so he was pleased with the little trampoline in the ground which is just right for him. He had a go holding onto Granny, and then had goes on his own too. Another feature of the park that he liked was the stepping log line – a series of tree stumps/logs that he could walk over and jump between. 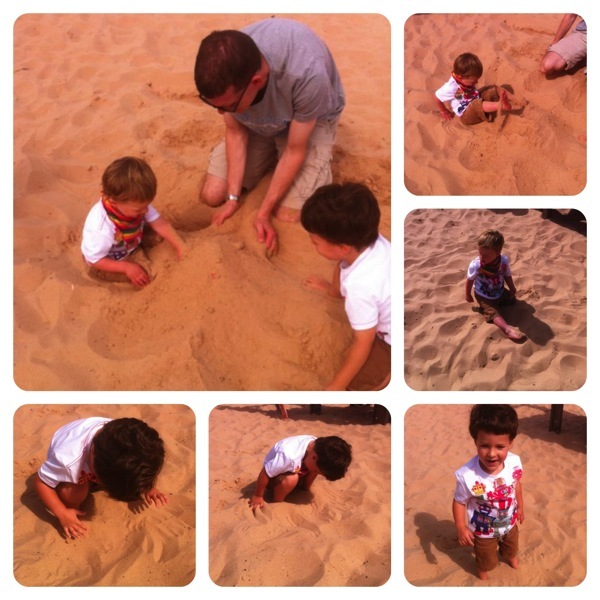 Andrew was mostly fascinated by these hand powered diggers in a large sand pit. They were obviously designed for kids a bit bigger than him who could put their feet on the ground, but he was determined to do it himself after some initial help from Granny when he first had a go. He got the hang of what each handle did – one moved the scoop up and down and one pulled it in and out – and by the end he was very successful at scooping sand, the only problem was he needed my help in swivelling him around to dump the sand in a different place because his legs were too short to swivel himself. Joel was interested too, until he realised that he couldn’t do it himself, he was definitely too small, so off he went and left the sand pit. The other part of the park that Andrew liked was the older kids bit which is outside of the fenced bit with most of the equipment in it. 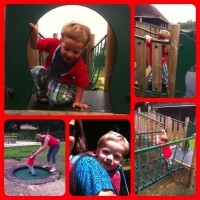 He’s very into ‘tubey’ slides and enjoyed the challenge of climbing up the ladder and across the rope bridge to it. Joel also wanted to have a go, but of course was way too small, so Granny took him into the basket style swing that was just opposite this rather large climbing frame. But soon Andrew was bored of the slide and wanted to go back to his digger! Once we’d had a good amount of time on the playground, we found where the path was to go on a bike ride (well, Andrew rode, we jogged!) around the rest of the park. It took us on a route around a small lake and then up a hill. I didn’t get any photos of this – I was too busy keeping up with Andrew and Granny at the front and had Joel on my back in the sling. 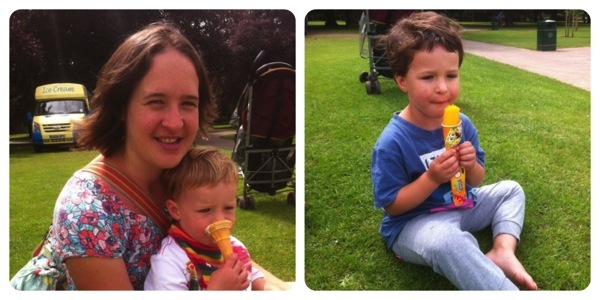 When we got to the edge of the park, we headed into Kenilworth town centre for a quick bite to eat and well deserved cool drink. 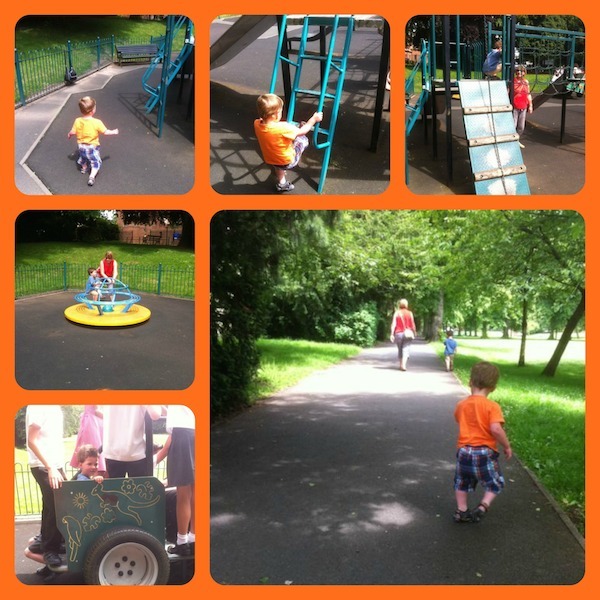 Andrew walked once we were out of the park, but got back on his bike when we returned to the park where the car was parked after our snack – he enjoyed riding down the big hill, controlling his brakes very well, also with a little speed control help from Granny! It was a fantastic morning out and we will certainly be back here again soon! 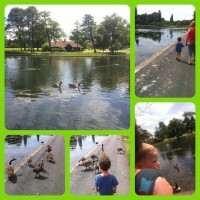 Last Sunday morning we went to our local park – the War Memorial Park in Coventry. Andrew had been a bit sick earlier in the morning, but he wasted to go out and get some fresh air, so we thought a trip to the park would cheer him up rather than our usual Sunday morning activity of going to church, where anyone sitting in the pew in front of us may have ended up being showered in sick – at least in the open air such an incident would be more easy to deal with! Anyway, he was generally ok, if a little slower and less bouncy than usual, and he slept for quite a while in the afternoon when we got back, so he must have been ill.
Andrew was happy to play quietly in the huge sand pit that is the playground, burying Daddy’s legs and then having his own legs buried, while I ran around after Joel, who allowed his legs to be buried just the once. 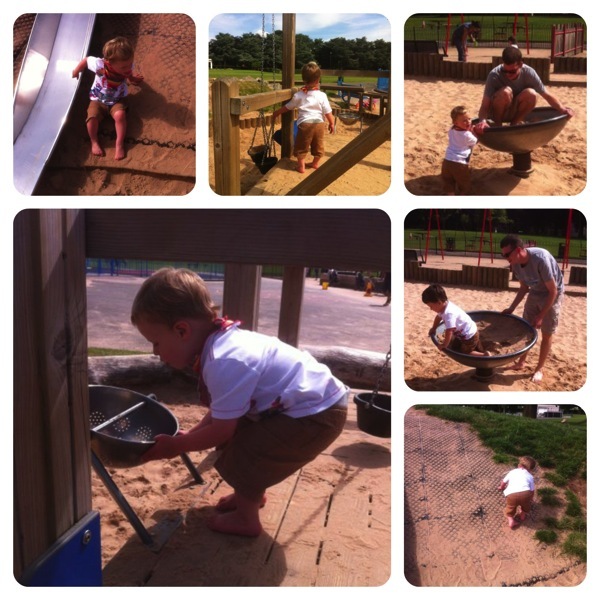 Joel was all over the place, as usual, on the slide, the round about, climbing up the grassy mound to the slides, running down it, sieving sand, lifting it up in buckets etc. etc.! He even had a go at pushing Daddy around on the round about. Then another family noticed that there were a couple of guys in council uniforms opening up the water park area next to the sand park. This has been there for a while now, but I’ve never seen it open. There is a sign on it saying that it’ll only be open in school summer holidays, so I thought maybe they were just cleaning it or preparing it for the summer holidays in a few weeks. But before we knew it, there was water shooting up all over it and the other family were in and splashing about. So we followed…. This really cheered Andrew up. If I hadn’t have seen him more ill in the morning, I would never have known! He was running about all over the place, splashing in the water, getting very wet. 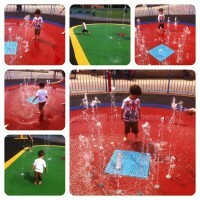 He particularly liked running under the fountains that made arches up and over him. Joel, on the other hand, was a little scared of the shooting water, so preferred to run around on the bits that weren’t working yet – about half the water features were working and half weren’t, but as it was only us and one other family there, there was plenty of space for us all to run around in the wet bits. We’d taken a change of clothes, so when Andrew decided he’d had enough of the water, I stripped him off and put on his dry clothes. He’d also spotted and ice cream van by that point and asked for an ice cream. I told him that an ice lolly would be ok (sugar and water was probably just what he needed), so he happily munched on that. Joel doesn’t like ice cream – I think it’s too cold for him – so I got a soft ice cream in a cone and he ate the cone for me (which I’m not fussed about!) Considering the morning had started so miserably, we were glad to have had such a fun morning out, and see this water park that has been shut so many times before. After a couple of weeks’ break from the #CountryKids linky that I usually join in with, I thought I’d share this quick post. Weekends have been very busy going over to our new house and sorting stuff like cleaning, shifting junk that the previous owner just left there, and preparing it for the decorator, so I haven’t had much time to blog our outdoor adventures. 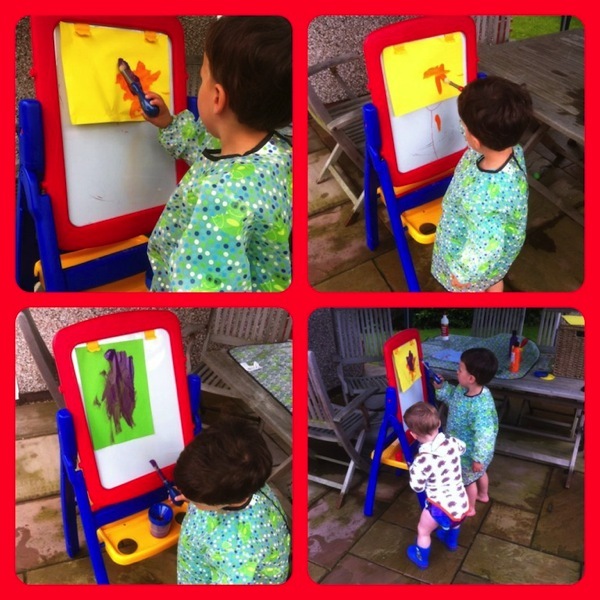 As the weather has been so nice, we’ve been spending a lot of time outdoors, either in the garden with the paddling pool or at the local park. I realised that I hadn’t yet blogged about a park local to Granny and Grandad’s house where we’ve been living, the one that I find the least stressful to take both boys to on my own – Whitley Common Playground. 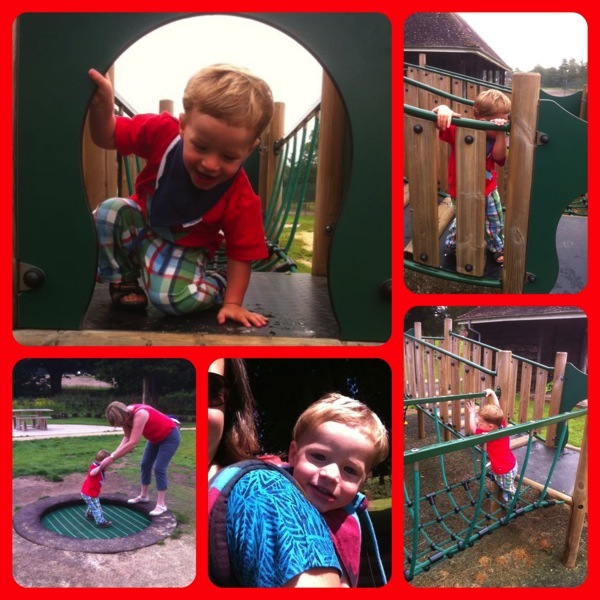 The big park that is nearest to us is hard for me to take them to on my own because there are no fences around the playground so Joel just runs off, and Andrew tries to climb on the teenage climbing frames whilst my head is turned running after Joel – bit of a nightmare! But the Whitley park is much better for us in this respect. It’s not huge, but it’s the perfect height and experience level for the boys to do on their own. Obviously I’m there to help and watch them too, but I only have 2 hands and eyes in the front of my head. There is also a fence around the toddler section, which slows Joel down when he tries to escape – he has just learned how to throw his whole weight on the gate to open it, but at least I get longer to spot that and run after him than an open field! 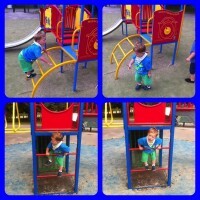 And because the climbing frame is just right for him, he doesn’t often try this on anyway. The ground is that lovely squishy astroturf too, which is great at cushioning any falls. Andrew loves going down the fireman’s pole, as you see in the pictures above, and this is great because it’s the smallest pole like this in a playground that I’ve seen and he is getting good practice at doing this without being very far from the ground at all. He also likes playing with the clock on the end of the climbing frame, telling me what time is is, and on the other side of this there is a ship’s wheel that he likes to stand at and turn, pretending that he’s ‘driving’ a ship. There is quite a bit of space just to run around on the soft ground too, and when there are other kids his age there too, they often end up playing a game of chase on this, which he really loves. 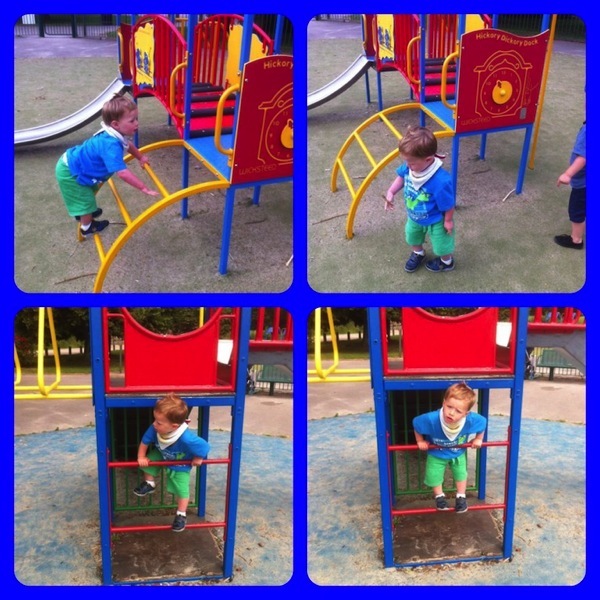 Joel is definitely a climber – he climbs wherever he can (or can’t! ), whether that’s on furniture at home when I’m not looking or climbing frames that are really too big for him, he has no fear! But the small toddler frame at this park is perfect for him. He also likes to climb the slide, though I try to dissuade him from that, especially if there are other children trying to come down it. I think most kids go through a phase of wanting to climb slides rather than slide down them, and he is definitely there right now. As well as the toddler section of the playground that’s within a fence, there is also an older kids’ section outside of the fence next to the common – an open field where lots of dog walkers go, which is some distance from any road so it’s quite safe anyway. 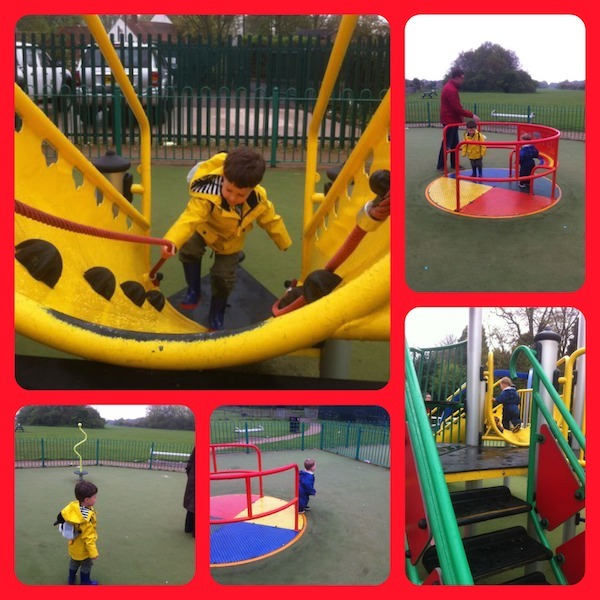 Joel quite likes trying to climb up on the bigger climbing frame, as you can see above, and actually with a bit of help even this isn’t too difficult for either of the boys, and they enjoy sliding down the bigger slide at the top of it. In this section there’s also a big tyre swing that Andrew likes to go on when there are other kids his age, but Joel is happier on the toddler swings in the fenced part. As I said, it’s not massive, but there is a variety of things to play on that are all brilliant for the boys’ current size. They don’t seem too fussed by the seesaw, which you can just about see in the distance in the picture above, though Andrew likes standing on the ground and pushing it up and down with his hands, and Joel occasionally comes by to see what he’s doing. 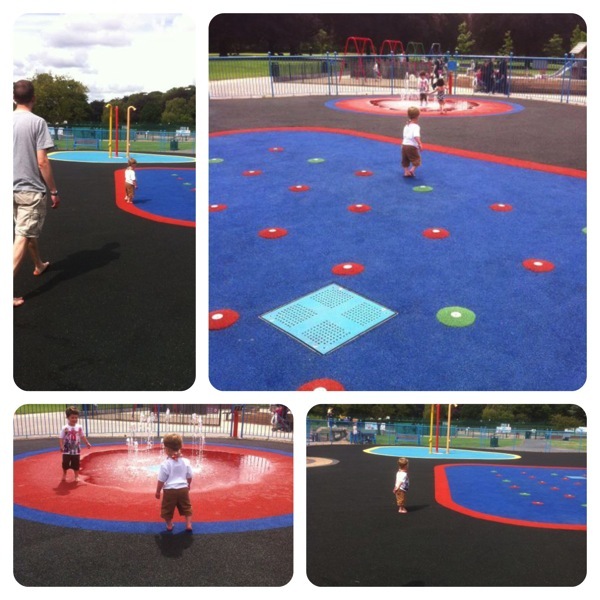 I’m glad that we’ve had such a good park close to where we’ve been living, and I’m glad that I’ve now written a record of it to look back on when the boys are bigger. The local park at our new house is perfect for Andrew’s age and older, which will be good for them to grow once we finally move at the end of the month. Yesterday came the day that we finally took the boys to see our new house. We’ve been talking about this new house with them for a while and aI think Andrew was beginning to wonder whether it really exists. We still need to get some work done on it – just decoration, nothing major – but pinning work men down to a particular day to start work can be tricky. As Granny had the day off, we decided to all head over there while Daddy was over there already as the electrician was finishing off. 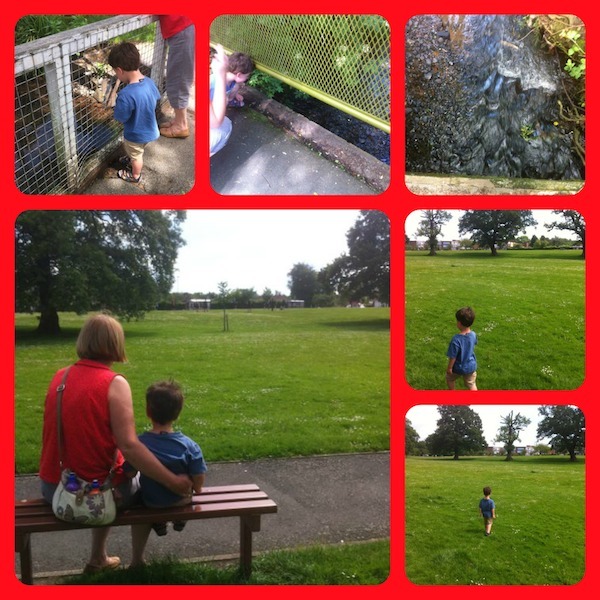 It was such a lovely sunny day that we thought it would also be a great idea to explore the local parks with the boys, as well as show them the house. I’m not sure that they were that impressed with the house – there is little furniture and no toys there – but Joel seemed to like the stairs (it’s set over 3 floors) and Andrew liked to hear whose room was whose. After we’d given them a tour and had a picnic lunch at the house, we left Daddy doing a few more jobs all the while that he needed to be in for the electrician, and headed out down the road in search of our local park. We knew there is a nice green area with a small lake not far from the house, but we’d not actually been down the path yet to find it as pedestrians rather then just driving past it on our way into the road. But we followed our sense of direction and at one point this was confirmed by a dog walker. It’s a lovely area to walk through, very quiet and most of it is just on paths beyond where the cul-de-sac roads end. As the path opened up at the end, we suddenly saw the small lake, and walked up further to watch the geese and ducks being fed by someone else. Unfortunately we hadn’t got any bread with us, but I’m sure there will be plenty more occasions to go and feed them in future! We walked around the edge of the lake, and came across a building – the Bournville Model Yacht Club – I bet that’s fun to go and watch when they are out with their toy boats. Andrew was slightly disappointed that there was no playground in this ‘park’ (a park isn’t a park without a playground in his opinion). So I looked on the map on my phone to see exactly where Bounrville park was in relation to where we were, because I’d only ever seen it from the main road and knew there must be a shorter route to it. And sure enough, there was a lovely path leading from the lake to the park. As we walked along it, we passed the Cadbury college (local secondary school) which has purple bits all over its building. In the field between the school and where we were walking, Andrew spotted some teenagers playing a game. He was insistent that it was football, until we got closer and we could tell that it was in fact that British school classic – rounders. We tried to explain it to him and sat for a few minutes on a bench to watch. We walked through a slightly more wooden area beyond the school, and came to a bridge over the Bourn (brook) that was perfect for playing Pooh sticks on, which Andrew was desperate to do and had tried further back at a bridge near the lake where the water wasn’t very fast flowing. Just beyond the Pooh sticks bridge was an entrance to the park, and we could see the playground in the distance – phew! I got Joel down from the sling and we all walked through the park. The playground was full of school kids, clearly on a trip to Cadbury World which is just over the road. But they were very good, and let the boys have a go on some of the things that they had taken over. Through the fence of the park up by the playground, we could see through to the local infant and junior school that we will put as our first choice for Andrew’s school place soon. I showed Andrew the lovely toys and craft equipment that they had out in the garden area, and he seemed quite impressed. Once we’d had a good go on the playground, which wasn’t too long because it was very warm and there was little shade, we thought we could go and find an ice cream over at the local shops across the road. We crossed over at the school crossing, which is almost opposite the Cadbury factory, and found a newsagent with a Walls sign outside. There was also a bench to sit and eat them after we’d bought. This gave us all a bit more energy to walk back home, which was a shorter walk than on the way out when we went via 2 parks. Andrew had been very good and walked most of the way, but needed a bit of a carry up the hill on the way back. After quite a few weeks of blogging about our out and about adventures for Country Kids, I thought it would be good to do another garden fun post, especially because this week I have really appreciated the fact that we now have a garden (admittedly this particular one is temporary, but we do have one at our new house too). The first two days of this week were very showery, so the garden was the perfect place to be in the afternoons after nap because we could just nip back in again or shelter under the gazebo if the rain got too heavy for a little while, then go back out again when it stopped. Wednesday afternoon I realised just how much we appreciate going in the garden – a case of you don’t know just what you’ve got til it’s gone – because it was absolutely pouring with rain the whole afternoon and even the boys didn’t want to go out in that, so got very wound up inside, and trying to entertain a 3 year old and 19 month old with the same indoor activity for a few hours is tricky. So now I am so grateful when we can just open the door and get out in the garden. 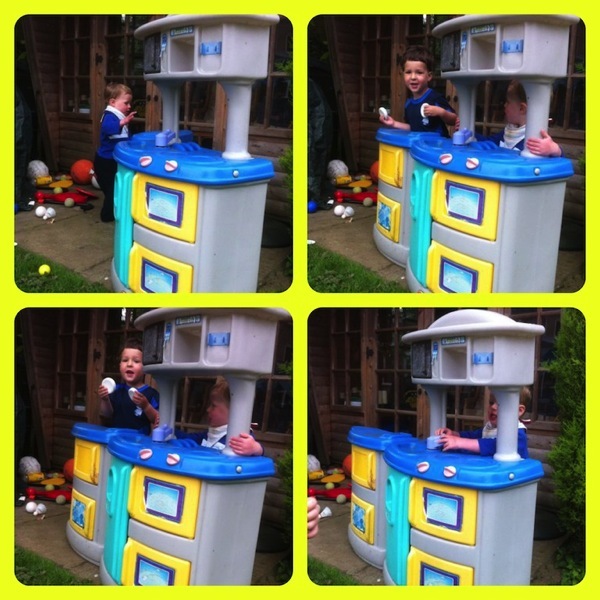 One of Andrew’s favourite role play games at the moment is to pre tent to be an ice cream seller. He stands behind his kitchen and shouts out “Anybody want an ice cream?” loudly and repeatedly until someone takes him up on the offer. He then takes a shuttlecock for the cone, and various coloured balls act as ice cream scoops of different flavours. Recently his ice cream business has branched out into toasties – white discs that go in the giant connect-4 game which come apart and he can sandwich some knid of filling inside for you. In these pictures, Joel was also joining in with this game, even if he didn’t realise it: Andrew said he was doing the washing up, which is fair enough because he was standing by the sink. 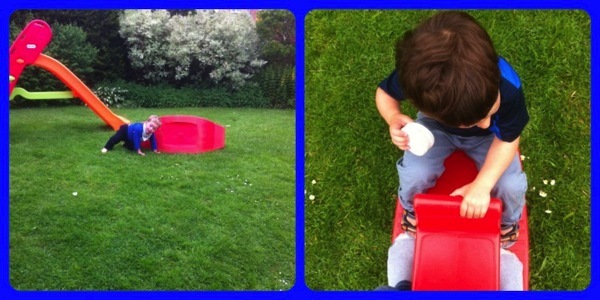 The slide that Andrew got for his birthday in the winter and which will come with us to our new house rather than staying at Granny and Grandad’s house when we move is always popular with both boys, even though it says from age 2 – things like that don’t bother kamikaze Joel. 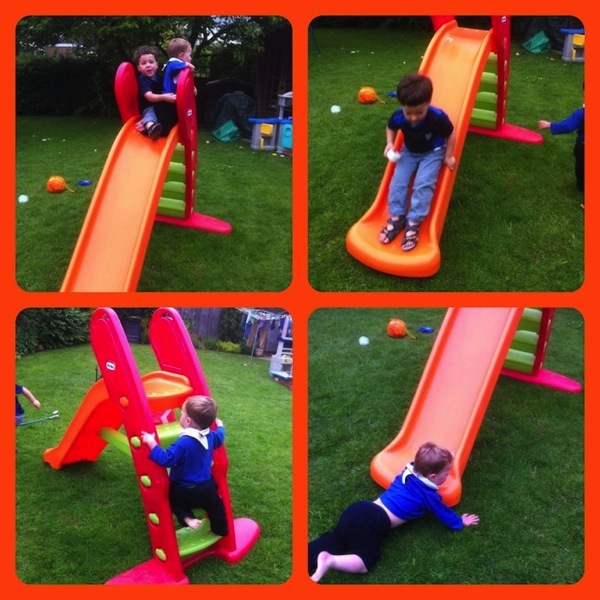 Recently Andrew has taken to going up the ladder behind Joel and making them do a “doubler”, that is slide down the slide together, Joel at the front and Andrew at the back. They both seem to like it, even if it does take Joel by surprise sometimes. They both like sliding down it in the most unconventional ways too, like Joel has on his front in the bottom right picture here. 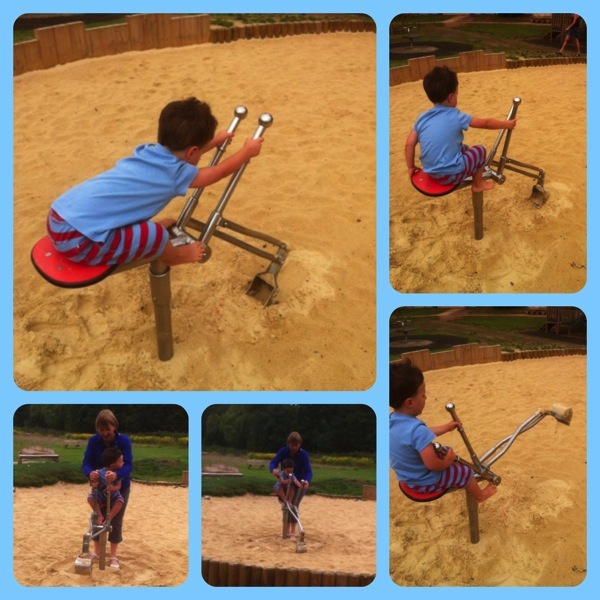 The seesaw is also popular, even if not always as a seesaw. Joel likes turning it on its side and climbing over it like it’s a climbing frame! Andrew likes it when I get on too. 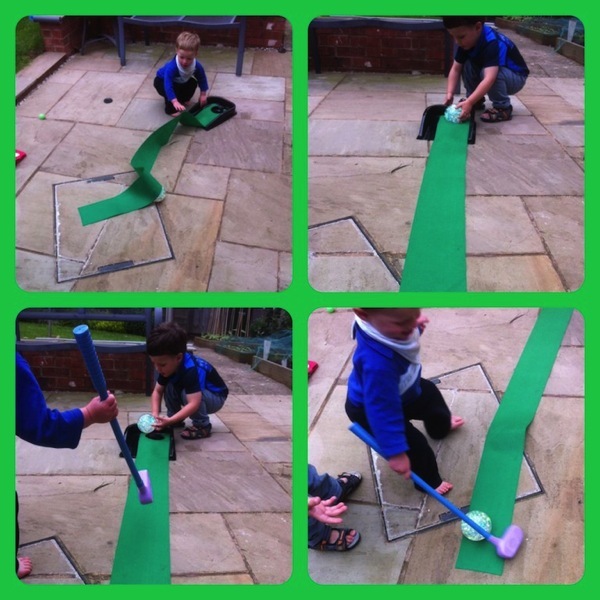 A popular game this week has been the junior putting golf set that Great Grandma bought for them last week. Here you see them using a rather large bouncy ball rather than a small plastic golf ball, which was hilarious to watch! They did do a pretty good job at sharing it though, which isn’t always the case these days, though it does help that we have (at least) 2 clubs. Andrew got more annoyed with the wind than with Joel, as it kept blowing the green strip up until we weighed it down. Andrew is still not really into doing much drawing or painting – he’ll happily cut and stick but he’s not so fussed about colouring with crayons or paint. But I thought it would be a good idea to try and encourage him to do a bit more by getting the paints and his easel outside. He had a bit of a go this week and painted a penny farthing (the orange picture) and a rocket (the purple picture), two of his favourite vehicles. Joel was eager to get at the paints, but I only had enough pairs of hands to supervise one lot of painting at a time, and by the time Andrew was finished, Joel wasn’t bothered and was off playing in the garden. In general Joel has shown more interest in colouring and painting when we’re at groups than Andrew has. I’m interested to see if Andrew becomes more interested in these things once he goes to pre-school in September. At the weekend we had a very special occasion – the boys’ uncle and aunt (Daddy’s brother) got married in a lovely village in rural Suffolk where the bride is from. We had a fantastic day, the boys did very well in their roles – the 2 little ones as page boys and Daddy as best man – and it was a really lovely opportunity to catch up with family whom we know and meet those whom we didn’t know already. The wedding itself was on the Saturday, and then on the Sunday we decided to head to the coast, only 10 miles away, to Southwold. 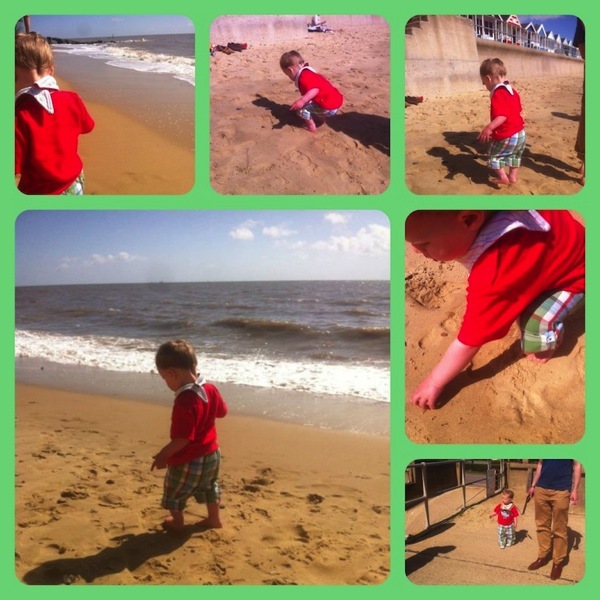 Most of our immediate family were either heading back on a long journey straight away, or going to the church service, but as the boys had already sat brilliantly through one service the day before, we thought that a trip to the beach would be better for them. We too didn’t have masses of time before the journey home, but enough to have a paddle and a walk along the pier. When we got there just before 10am, there were hardly any cars in the car park and the place seemed quite empty. 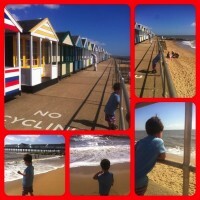 We parked right behind the row of beach huts, the iconic feature of this region of English sea side. As we walked to the end of the row, we saw the steps to get down onto the beach, not that there was a slot of beach at that point because it was high tide, but there were only a few other people there so we still had lots of space to ourselves. We took off shoes and had a little paddle. The water was cold but it was such a nice warm day that we didn’t mind. The boys enjoyed letting the waves chase them up the beach as they crashed in, though Joel was less sure about getting wet than Andrew was. Both boys were most interested in throwing pebbles into the water, or sometimes more like big rocks compared to their size! Both have a pretty good throw on them, better than mine I’d say. It was lovely to be able to run about on the sand, an experience that they don’t get very often living nowhere near the seaside. Daddy doesn’t get as excited about visiting the beach as I do, because he grew up with a sea view from his bedroom window, and I think the boys will be like me in this respect. After we’d finished having fun on the beach, we headed over to the pier and walked along the length of it. The whole town and especially the pier had a very classy and not at all tacky appearance, which is what I tend to associate with piers and traditional British seaside resorts. The pier was very tastefully done, with a cafe and a couple of shops along the length. There was a weird clock halfway along it, which was once a temporary exhibit somewhere but now lives here permanently. It’s driven by water and does a little ‘performance’ on the half hour and hour. Andrew thought this was hilarious. We stopped and had a drink at the cafe, and sat on an ingeniously designed bench that acted as a wind break from the fairly strong wind that was blowing across the pier. After our refreshment break, we walked back along the pier and crossed the road to the park. Unfortunately the playground equipment there was a little old for our boys, so we just walked on a bit further and watched the boats on the boating lake for a little while. That was about as much time as we could spend as we had to head back home which was a good 3-4 hour drive with a stop. 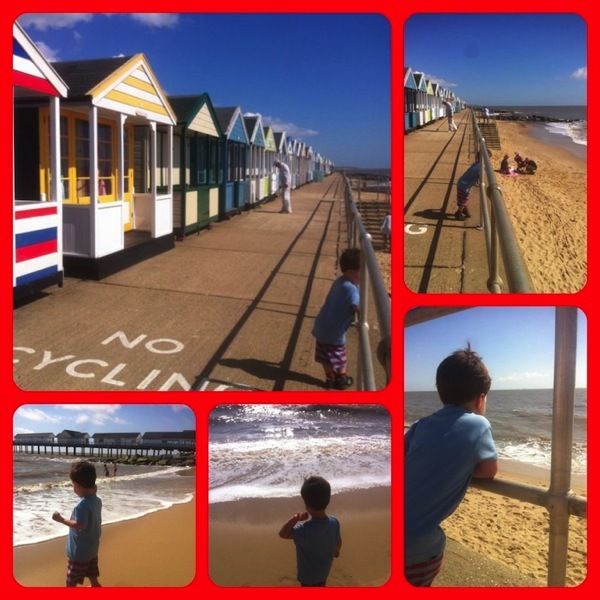 We very much enjoyed our little trip to the seaside, and were so pleased that the weather was lovely enough to have a good walk and play on the beach. At the moment, Daddy is commuting to work every day on the train from Coventry to Birmingham. This means that he goes right past Birmingham Airport. He noticed a few months ago when he first started the commute that there was a sign for a place called Sheldon Country Park near the exit of Marston Green station (a suburb of Birmingham) which is at the far end of the runway, past the station for the airport itself. So he googled it and found that it’s a lovely big open space, right at the end of the runway where you can stand quite freely and watch planes come over your head just before they touch down on the tarmac. There is also a kids playground and a city farm at the other end of the park. Given all this, we thought it would be right up the boys’ street to go and visit. We’ve actually been twice in the space of a coupe of weeks – once in the car just after Easter, and once on the train on the early May bank holiday. The first time we went, we parked in the car park which is at the end of the park furthest from the runway but nearest to the playground. There were hardly any other people around when we got there, so the boys had the park to themselves. After about half an hour on there, we decided it would be a good idea to try and drag them away so we could walk up to the other end of the park by the runway. We’d been seeing planes coming in at the distance of the park, which was pretty amazing in itself, but we knew we could get closer. So we got Andrew’s ball out and encouraged him to run after it. 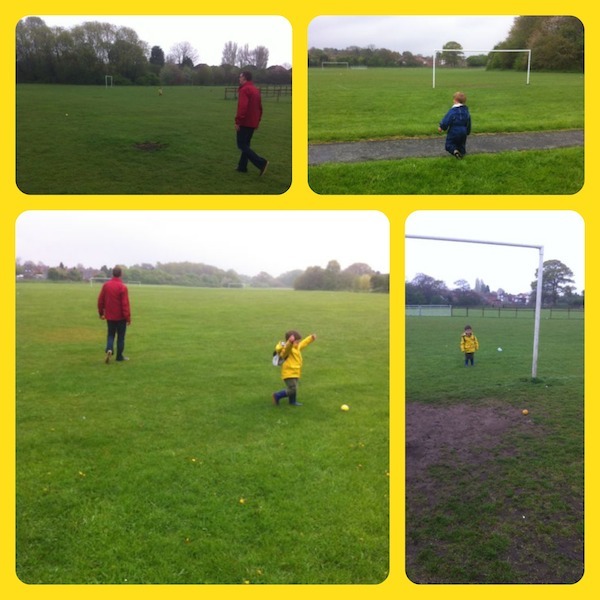 There were football pitches on the way, so we scored a few goals between us as we went – he loves scoring goals! He was a little reluctant to walk all the way to the runway, not that it was that far, but we kept having to entice him with the thought that he was going to see some planes REALLY close up. Eventually we got there, having seen a few more planes come in ahead of us as we walked. Andrew was not disappointed! 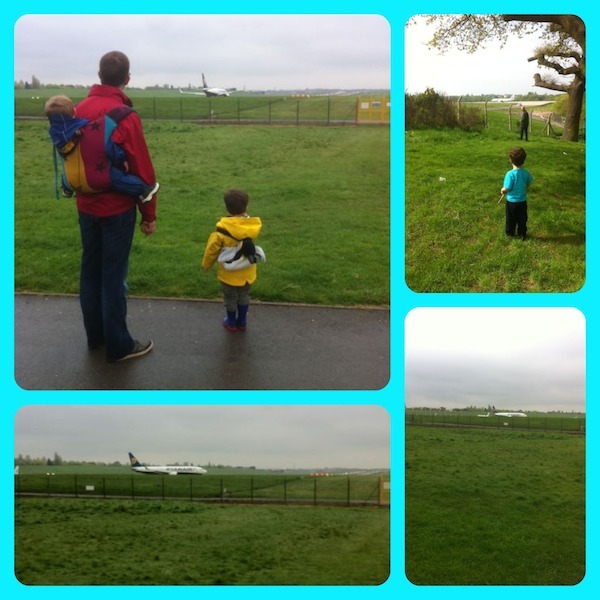 We stood right at the end of the runway (behind the fence, obviously, still in the country park so there was grass and a good path as well as benches where one could sit (clearly with 2 toddlers we never get to sit). Soon enough we saw a plane in the distance, and watched it, head on, come towards us and then fly right over the top of us. We could see the wheels and the flashing lights and lots of detail underneath the plane, it was amazing. Andrew was in his element and didn’t mind the roaring noise at all. Joel was happy to stay in the sling, and was a little more cautious about the noise, but still seemed to be enjoying it. By this time it was about 11am, and there was a steady stream of planes landing and taking off. The noise standing behind jet aircraft as they took off was loud, but they soon whizzed along the runway away from us. That day we had planned to go to the boys’ Great Grandma for lunch, so we knew we’d have to drag them away at some point, and eventually Andrew walked back with the promise that we’d come again. And he didn’t have to wait too long, because we decided only a couple of weeks later to take advantage of a £1 day ticket on the train (because Daddy has a season ticket) and head back there on the bank holiday. We approached the runway from the other side this time, which is just a short walk from the exit of Marston Green station. There weren’t quite so many planes to see on the bank holiday, but still plenty enough, and the weather was nicer so we just played in the park for longer too. Joel was more confident this time and was signing ‘plane’ all over the place as well as running around on the grass in front of the fence. 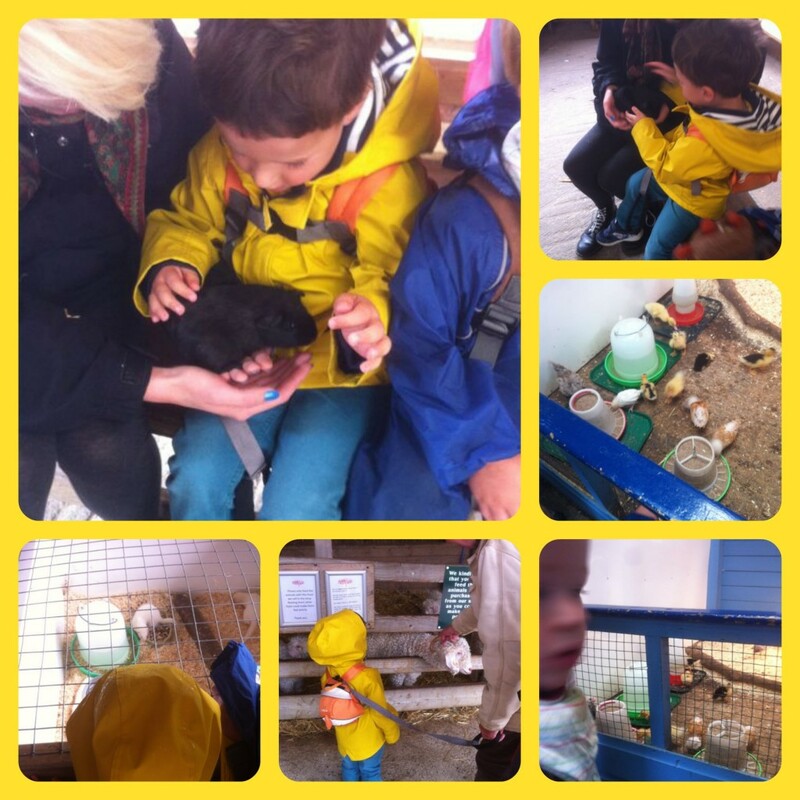 We also had a visit to the city farm on both days, which is a lovely idea, set up to educate local children in a big city about where their food comes from and how animals live in the countryside. 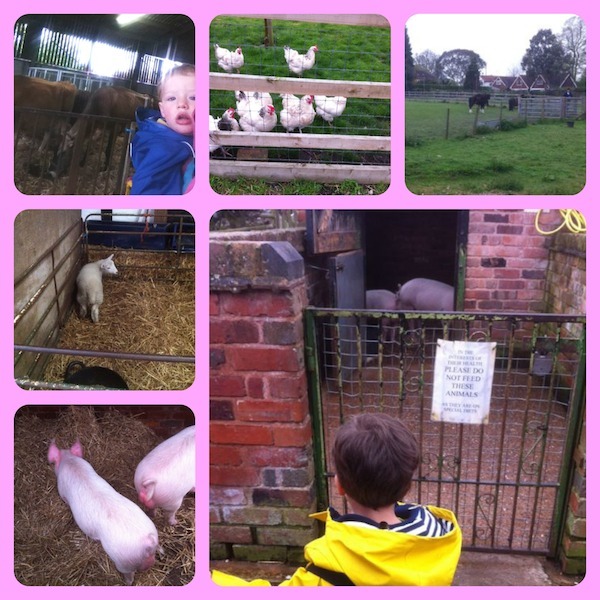 We saw cows, pigs, chickens, sheep, horses and more. It’s not huge, but it was lovely to have a quick wander around with the boys. Andrew caught sight of a bouncy castle there on the bank holiday, and as it wasn’t very expensive, we let him have a go, which he loved. We’ll definitely be going back again and again, especially when we live in Birmingham, though it’s probably a similar distance there from where we’re currently living.